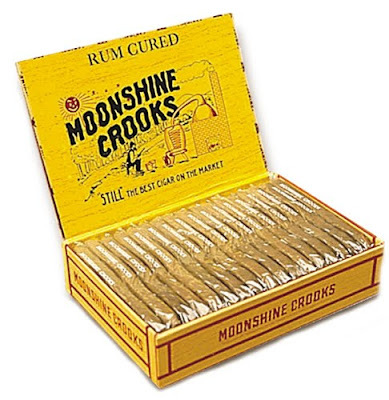 If you came across a box of Moonshine Crooks in a store, you might think they were a novelty item, what with the cartoon moonshiner depicted on the lid and the bent shape of the cigars in the box, but they aren't a novelty item, they're a real cigar. "Crooks," says the Cigar History Museum, are a "type of cigar which, after being made, is pressed in moulds to take on a rectangular cross section with a double bend in the middle. Almost always sweetened with various sugars and/or liquors. Most popular in the 1950's, a beginner's cigar for many smokers, the style can be traced back as far as 1900 with certainty (probably earlier)." Moonshine Crooks are "rum cured" and made in Red Lion, Pennsylvania by the last cigar maker in town, T.E. Brooks & Company (also known as G.W. Van Slyke & Horton). 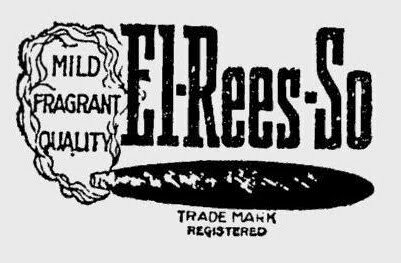 According to Tobacco Reporter, the company also makes Don Rey Dons, Spanish Maid Crooks, Canadian Club, Hava A Sweet, Brooks Grande Prima, El-Rees-So Sweets, and Palma Throw Outs. 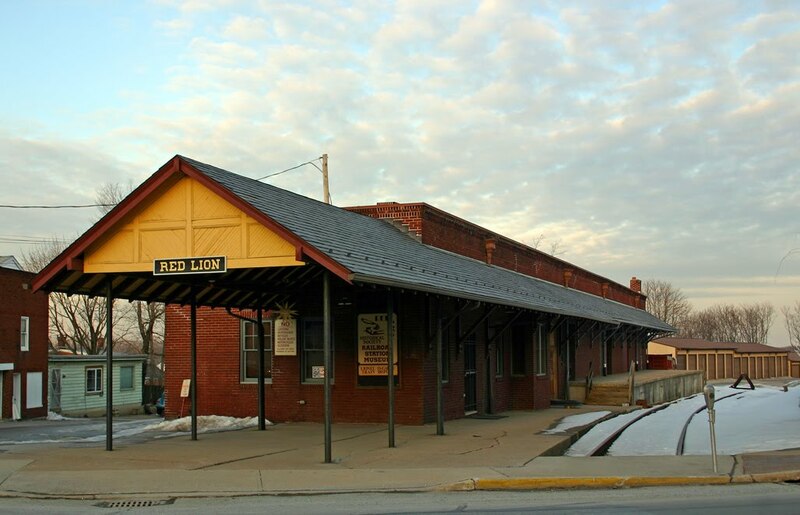 At one point in its history, Red Lion (York County), was home to 150 cigar factories. In October of 1929, the local railroad (the "famous MA&PA"), shipped out 15,000,000 cigars and 1,633 cases of tobacco. Today, old industrial Red Lion is almost gone, the cigar factories and railroad having given way to cigarettes and automobiles, so I was excited to see that there was one last cigar company cranking out some old-timey smokes. The problem, like so many vintage American brands, was finding them, it took a little internet sleuthing, but I finally found some Moonshine Crooks online. How are they? Well, they're not bad, not bad at all. They sport a genuine leaf wrapper and I don't know what inside, but it tastes good. The telltale crook is plainly evident in each cigar. At around a buck each (and much of that taxes), they won't stand up to a premium cigar, but they aren't supposed too. If you match them against other inexpensive, flavored, machine made cigars, they stand up quite nicely - sweet, mild, and flavorful. And maybe it's psychological, but they do seem to taste better before the crook is smoked up, but by that point, you're almost through anyway. You can get a five-pack of Moonshine Crooks from Amishshop.com (more on them in a future post when I'll be trying out their "Amish Cigar Sampler"), and they are also available by the box (50) at Finck, Carey, etc. online. Recommendation: Recommended. Industrial history never tasted so good.